The hammerheads occur worldwide, but some species have more restricted ranges. The most widely distributed species is probably the smooth, or common, hammerhead, Sphyrna zygaena. They inhabit shallow waters along the coasts, bays and harbors where the water is calm and the bottom sandy. The eyes are located at the ends of two thin protrusions, resembling a hammer. The caudal peduncle lacks keels. Of the nine species of hammerhead sharks, the largest is the great hammerhead, S. mokarran, which may reach a length of 20 ft (6 m). Its head is T shaped, being almost straight along the front edge and notched in the center. 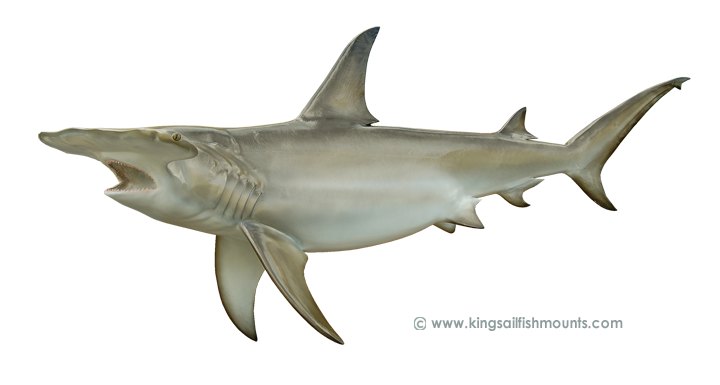 Another large species, the smooth hammerhead, S. zygaena, grows to 14 ft (4 m). The front edge of its head is rounded and unnotched in the center. The scalloped hammerhead, S. lewini, grows to 10 ft (3 m). The front edge of its head is rounded and notched. Of the lesser known hammerheads, there is S. couardi, a large West African species that resembles S. lewini, and the strange looking S. blochii, whose head lobes often measure 50 percent of the body length and are swept back like the wings of an airplane. The remainder of the species, S. tiburo, S. media, S. corona and S. tudes, known as the bonnetheads, are only 3 6 ft (1 2 m) long and have very short lobed, shovel shaped heads. -receptors that enable the shark to detect food buried beneath the sand. Stingray are a favorite food. According to scientist Perry Gilbert one large hammerhead was found to have 96 stingray barbs imbedded in its jaw, mouth and head. Hammerheads fight hard making long surface and midwater runs and thrashing about causing a great deal of commotion. Fishing methods include slow trolling, drifting or still fishing with chum and baits that are oily or bloody. Mackerel, jack, squid and other baits, as well as artificial lures, may also work on occasion. They are viviparous and giving birth to as many as 30 or 40 young at a time. Some are known to be man eaters. In fact, the first fatal shark attack recorded in American waters was by a hammerhead off Long Island, New York in 1815. The meat of the hammerhead is of good quality if fresh and properly prepared. The fins are used in soup in some areas.